After hours and hours of uploading our Aylmerton photos, they are finally all done! Enjoy spending hours and hours looking through them! Don't forget to have a look at our Year 6 Leavers' photos and videos on the Upper School Phase Page. The videos take a little while to load... If they keep pausing, just press pause and leave them to load for a few minutes. When you click play again, they should continue without interruptions! The songs playing over the videos are the songs that your children insisted on singing...constantly... for the entire trip! Monsoon Shelters & Walking the Plank! Our Silly Awards Ceremony on the Return Journey! Thinking of going on the Year 6 residential this year? Please have a look below for a small taster of the experience our pupils had last year. We went to our next activity:the low ropes. I was used as the guinea pig! I had to climb up the 10 foot high ladder and kneel at the top to clip my harness to the first green clip. Next I had to stand up and attach my harness to the orange clip then undo my green one. I could then travel across the terrifying plank of wood. Concentrating hard, I balanced my way to the end and landed on the next platform; I looked at the next thing I was going to do and said to myself - this is going to be easy!!! But it wasn’t as easy as i thought. I had to glide across a piece of rope while holding onto rope which dangled from the top. Finally, after two more challenges, I had succeeded!!! We were told that we would be doing an activity called ‘The Chair of Doom.’ We were all very excited and wondered what it was. First, we had to work out how to get the 'Chair of Doom' to the end of the zip wire so that we could connect our harnesses. Unfortunately, it was hanging above the middle of the river and we had to try to lasso it with a long piece of rope and pull it towards us. Once we had completed this first challenge, we all had a go at swinging across to the pirate ship. Most of us got wet! At Aylmerton, we did an activity called 'Bomb Defusal'. Using a map, we had to find ten clues which were hidden around the site. We then had to write the instructions down carefully on a clipboard. Once we had collected all of the instructions, we had to follow them carefully in order to defuse the bomb. Don't worry! The bomb was not harmful... it was filled with glue and feathers! This activity is called the spider web because there is a giant rope web, and the aim of the activity is to work together to get everyone through without touching the web. Some holes were easier to get through than others. We sometimes had to lift our teammates to pass them through the higher holes. You could only use each hole once and only two holes twice. We had to listen to each other carefully so that we could agree on a plan. This was a challenge but every team got through without being caught by the spider! 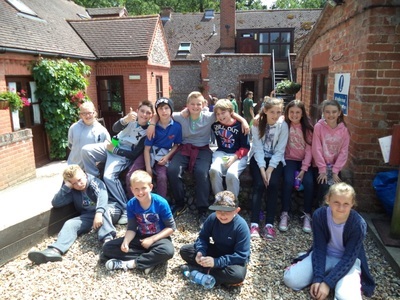 Written by Darcy B and Athina N.
On the 21st of June 2014, the staff of Aylmerton put together a magnificent monster trail. Everyone sat in the hall - which they called the Pavilion - and listened to our instructions. Suddenly, out of no where, a monster appeared from a door behind us. We all screamed; the monster sprayed us with a water gun! The monsters wore pitch black clothes with a devil mask. They crept around the woods with a dirty grin on their faces; they could smell children! We carried on walking silently through the woods. The danger began. We slowly walked towards an open area. All we could see were monster huts made of straw and twigs. We trembled as we passed them. ‘Rustle.’ ‘Snap.’ Something approached us from behind one of the straw huts. ‘BOO! !’ A monster jumped out and called one of the boys over to him. ‘Where are we on the map?’ he spoke in a deep voice. ‘Here’ Jack said feeling confident. The monster looked at him and nodded. ‘Yes, you are indeed,’ he said and he gave us a clue. We carried on walking towards a dark, stone staircase that was being covered by trees and bushes that arched over us. We stopped as we saw a lair, which was dark, gloomy and covered in slimy moss. We could hear a monster snoring; he was asleep in a cage down the steps. He awoke to the sound of our footsteps and shouted, ‘ROAR!’ We all screamed and hid behind the trees that were opposite the lair. This monster was kind and he gave us a clue: DO NOT FOLLOW THE ARROWS ON THE MAP!! With this useful piece of advice, we did what the monster said. We walked over to the meadow and took a path back into the woods. Silently, we crept towards a bunch of trees and before we could breath, in front of us stood a monster. He shouted. ‘Why are you here?’ We trembled and explained that we were on our way back to the Pavilion. The monster gave us the right directions and we made our way back but, just before the journey had finished, we had to cross another meadow where Elf - another member of staff - was sitting on a bench. Behind him there was a herd of cows and the last clue to solve our puzzle on the old, rusty gate. We trotted back to the Pavilion, our legs aching, and had a nice rest and a cold refreshing drink on the park. I enjoyed the monster trail the most it was amazing!!! On the 22nd of June 2014, the year 6’s were dropped off at Blakeney Point. We were split into two groups. We were with the leaders: Queenie, and Miah Man, whose real name is Jeremiah. We were aiming for a little lifeboat house in Cromer which we could see in the distance. We had to walk through the thick, deep marshes, the streaming river, and the rocky path. We walked five and a half miles in total! As we passed through the thick mus, Queenie shouted, “Okay guys come over here!” We all scurried over in the refreshing water. Queenie gave us some instructions: she had to make sure we were all safe. The next job was to find as many cockles as we could. My friend - called Maisie - found 43! Afterwards, we could try eating a plant that grows on the marshlands: it was salty and bitter. Most of us liked it, however the others didn’t. Excitedly, we got back in the mud and water. We walked… and walked… and walked, until it was time to eat lunch. I thought, oh yes a break. We had about 30 minutes. Next we walked… and walked… and walked. On the way, we discovered some magnificent stones and rocks and asked Queenie what types they were. Finally we had a break. All of us were exhausted and our legs were aching! We stopped on a high hill; the view was breathtaking! The waves were lapping over each other. The sand and stones were dazzling like lots of bright stars. Queenie let us lay down as we heard the spectacular sounds. It was lovely not hearing the sounds that we are all used to hearing: traffic, television, and loads more! As we got closer and closer to the lifeboat house, we met with 'Miah Man's' group. We walked quickly because we were nearly there. When we arrived at the lifeboat house, we hopped aboard a big boat. The year 6's got seated rapidly and were heading towards the seals. As we got there, the seals were laying down. They looked very sleepy even though they were still awake. There was a very scary seal; it had big, black, bulging eyes that kept on staring at you. Miah man gave us a little speech about the seals; it was very interesting. As the boat sailed off, the seals waved goodbye by swaying their flippers side to side. 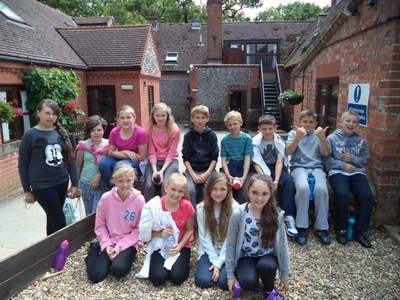 We stepped upon dry land and got on the coach to go back to the Aylmerton Field Study Centre. To conclude the brilliant day, my favourite part were the seals. They were very fascinating and enjoyable to watch. They were so funny when they were reacting to us!!! The day was so fun, however walking five and a half miles was hard work! 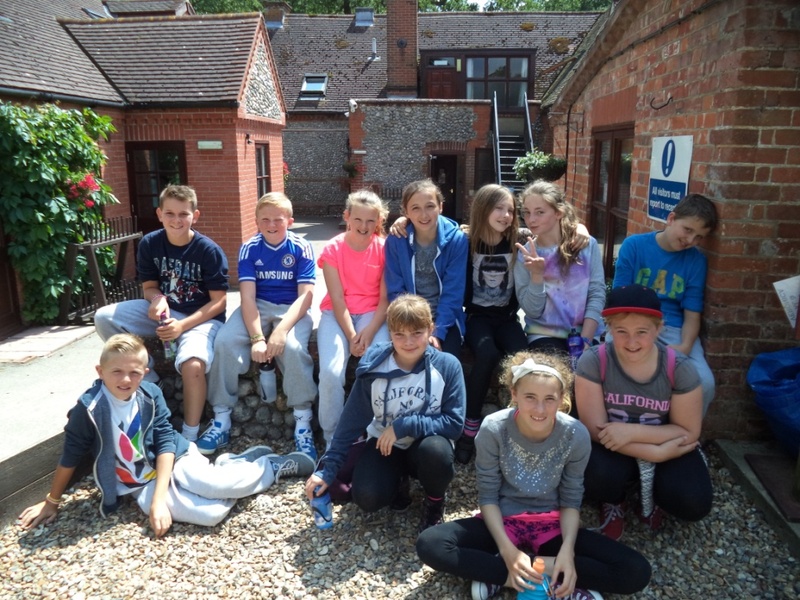 On Monday 23rd of June 2014, it was the year 6’s last day at Aylmerton Field Study Centre, so we decided to go Cromer beach and do a bit of pond dipping and go exploring. When we got there, we played a game called 'Crabs and Seagulls'. 'Tricky' and 'Miah Man' had a smelly rope that smelt like fish. This represented the tide which moved backwards and forwards over our heads. We had to move around like a crab while the tide was in and, when the tide went out, we had to be as still as possible. The teachers were the seagulls and would catch us if we moved! After our tiring game, everyone set off to discover what was in these ponds. I found lots and lots of sea snails (all different colours), crabs (all different sizes), shrimps and many more interesting things. Time flew quickly and we finished finding creatures so we began to set off in our groups. I was in 'Miah Man's' group and we decided to walk along in the sea. We took our socks and shoes off and went in. Me, Megan and Brooke went really far in; we got really wet! Then we came up to some rocks that were very difficult to get past. Despite feeling tired, we had a brilliant time at Cromer beach.